DCC LIGHTS FOR BACHMANN & HORNBY CLASS 08 SHUNTERS: DCC LIGHTING UNIT FOR HORNBY 08. DCC LIGHTING UNIT FOR HORNBY 08. 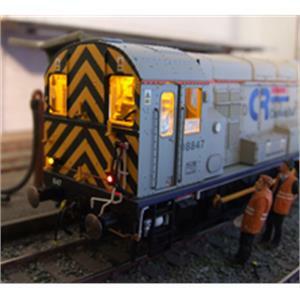 Description A 4 function lighting unit for the Hornby class 08. It has 2 red and 2 yellow independently controlled lights plus a cab light which comes on when either yellow marker light is switched on.